As we’ve mentioned in the past, having video content for any association no matter the industry is a great idea. According to Cisco, by 2021 video will control up to 80% of all internet traffic. 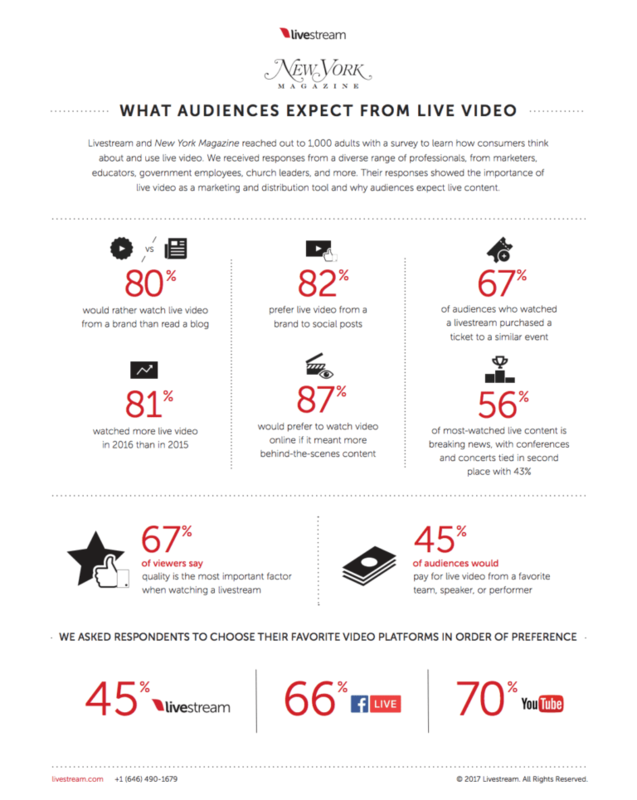 Additionally, a recent infographic made by Livestream shows that 82% of adults surveyed prefer watching live video from brands as opposed to consuming social posts. People are looking for video content, but if you aren’t promoting and marketing your video content the right way, you’ll miss out on the opportunity to connect with interested audiences. So, how can you make sure that people are subscribing to your YouTube channel, viewing your Facebook videos, and visiting your website to check in for more video content? We’ve got some tips you’ll love. Retaining your audience’s attention on your online videos is essential, so we’d like to show you 3 simple ways you can grow your video subscriber list and/or increase engagement and viewings on your online video content. Keep reading to learn more! YouTube is the largest video watching platforms on the internet, and it’s slowly been rising to one of the top most visited social media sites. So, if your association isn’t hosting its video content on YouTube, you’re missing out on a ton of opportunity to get that engagement and retention you’ve been searching for. And one of the best features Youtube offers is the subscription feature. This is a way for those watching who really resonate with your content to get it directly delivered to their subscription box, making sure they never miss out on a video from your association. It’s not only great for your audience, it’s amazing for your association’s video engagement rates- after all, a YouTube subscriber typically watches twice as much video content as a non-subscriber would. So, if you want your video content to gain the traction it deserves, you want to focus on enticing Youtube audiences to subscribe to your channel to keep up to date with the content you put out. One way to do this is to ask viewers either at the beginning or end of the video to subscribe to your channel to keep up with any videos, updates, or information that you’d like to share with them. A fun message from your association’s team can do the trick in convincing audiences to come on board as subscribers. You can also create a subscribe CTA graphic to show at the end of videos to remind viewers to subscribe once they’ve finished the video. Keeping it at the end will catch any stragglers who lost focus from being so focused on your video content. Does your association cover a bunch of different topics for all sorts of audiences? If so, you may want to consider organizing your videos into themed playlists for an easier viewing process. Although some of your members may want to enjoy all of your video content, there are some audiences that may not resonate as much with certain topics that you cover. Some may want to learn more about your association, some about their own professional development, so on and so forth. For those members, creating different playlists can be extremely helpful and encourage them to engage with more video content. Using YouTube again as an example, the video platform gives you amazing options on how to organize your videos up into playlists. You can also use tools that Facebook provides to create “album folders” with different video sets in each. Choose to organize your videos however you’d like in whatever way makes the most sense for you. Depending on whether you cover specific topics, have different video series that you create, or just use different formats to separate videos, there are a wide variety of methods you can choose to follow. Creating playlists can help video visitors not get overwhelmed by the plethora of video content you provide. No matter the video hosting platform you use, you want your videos to show up in search engines when interested users search to learn more about the topics you cover. With that being said, optimizing your video content by researching and using relevant keywords can do the trick. Being able to be searchable by target audiences is key to increasing engagement. While having your dedicated subscribers and members viewing your videos is awesome, growing your network of interested viewers is more than ideal for any association. And by using the right keywords, you can make sure your videos move to the top of search lists everywhere. In order to do this, you want to first figure out the core topic of your video. What is the subject you’re covering? What terms do you use within the video that could be buzzwords for audiences? What terms and/or string of words could be used by audiences to find your video on their web browser? Answering these questions, alongside market research into what keywords are popularly searched by web users, can lead you to the keywords you use to optimize your video. You can then include these keywords in your video title, video description, and hashtag section depending on the video hosting platform you use (for example, YouTube allows you to list multiple hashtags to help your video show up in their search feature). Growing your association’s online video engagement and retaining viewers is easy with the right steps taken. Try out our 3 tips and see how your videos can make more of an impact with your target audience in the future.